After spending a week in Bangkok so that I could continue to convalesce from my recent bout with Dengue Fever, we were all eager to get back to a beach. I had heard good things about Koh Lanta in general and was especially interested in trying some Southern Thai food which is renowned for its spiciness. We had made our travel plans too late to snag a cheap flight to Krabi on Air Asia, so we decided to head down South by train. Krabi is 800 km from Bangkok. There is no train that goes all the way to Krabi. You will need to take a bus, minivan, or taxi once you get to Surat Thani. The trip to Surat Thani takes over 9 hours, so you are better off taking a night train. That was sold out, which forced us to make the trip during the day. You might be thinking that a daytime trip would at least have some nice scenery on the way down. You would be wrong. But don’t worry, if you get bored looking out the window, there is usually a small child around willing to play a rousing game of kick the seatback. No, it was not our child. I would never let him annoy strangers like that. Besides, he was far too busy playing let’s-climb-on-daddy’s-shoulders-and-pull-his-hair. 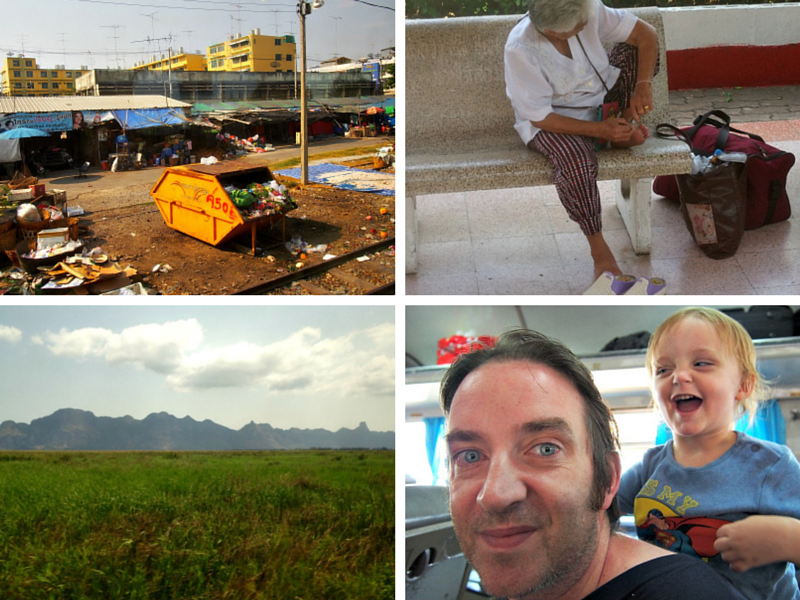 Clockwise: Scenery close to Bangkok, Toenail maintenance waits for no one, Toddlers get bored on trains, Pretty scenery the last hour of the trip. The train station is actually in Phun Phin, about 14km from town. As soon as you get off, you will be surrounded by taxi drivers wanting to drive you to your final destination. There is no negotiating with these guys. They have a sign put up over the benches with their prices. If you took the daytime train, it will probably be too late to get a minivan or bus to Krabi and your only choice will be a taxi. The price we were quoted for getting to Krabi town by taxi was 2500 baht. We chose to stay the night in Surat Thani and take a bus to Krabi the next morning. The taxi to our hotel was 300 baht. 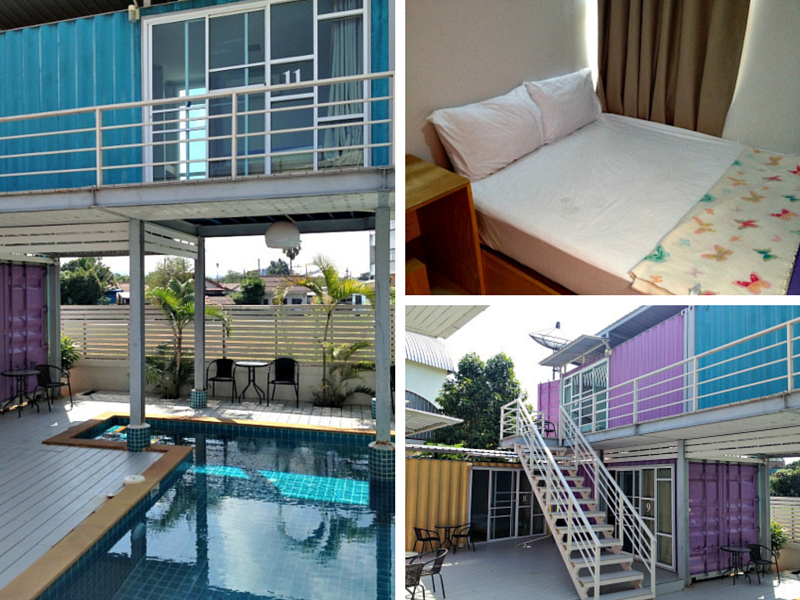 We decided to go for something a little different and stayed at Hip Box, a unique hotel made out of shipping containers. The rooms are tiny but they have air conditioning and wifi and there is a swimming pool. There is a small shop with a limited selection at the end of the street on the right. There is also a 7-11 not far away. To get there, turn left at the end of the street, walk 500 meters, turn right and walk 300 meters, 7-11 is on the left. Be careful because this is a busy street that you have to cross. There were not many restaurant options within easy walking distance and we were too tired to go exploring, so we stayed in and ordered from Micheal’s favourite standby, The Pizza Company. This hotel can arrange onward transportation for you but the prices were more than we had seen online and we had them call us a taxi to the bus station instead, which turned out to be a songthaew (200 baht). A minivan to Krabi bus station cost 400 baht for the 3 of us. From the bus station, you will take another minivan and a ferry to Koh Lanta (800 baht total for 3). 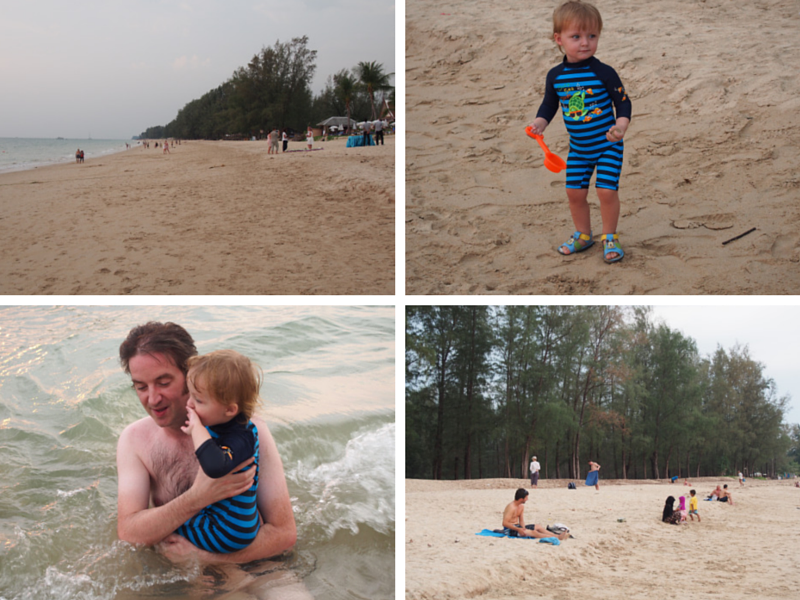 Koh Lanta boasts 9 beaches but we only visited two of them. The sand is clean but there are a lot of rocks in and near the water. I managed to trip and get a hairline fracture on my foot within the first 3 minutes of going in the water. The northern side of the beach is supposed to have fewer rocks but I wasn’t able to hobble any farther after messing up my foot. The restaurants with beach views that we tried were overpriced (90 baht for a side dish of plain rice!) and not any better than the smaller restaurants farther down the road. The food tasted exactly the same everywhere and it was not spicy at all, not even when I asked for it to be extra spicy. A huge disappointment for me. In general, the curries I tried at Muslim owned restaurants were very bland. Other Thai restaurants had more flavour but still very average and were not spicy at all. There is not much to see around Klong Nin, aside from the beach. As usual, tuk tuks are expensive to get to other parts of the island and it is much cheaper to rent a scooter if you want to go exploring. The wifi in the two hotels we tried was terrible and we never found a good cafe to work from. The street food was limited to fresh fruit and shakes. Another clean and pretty beach. Fewer rocks than Klong Nin but the water visibility was not good on the day we visited. More restaurant variety here but I still managed to not get anything spicy. There are no public showers on the beach so we stayed sandy and uncomfortable until we got back to our hotel. 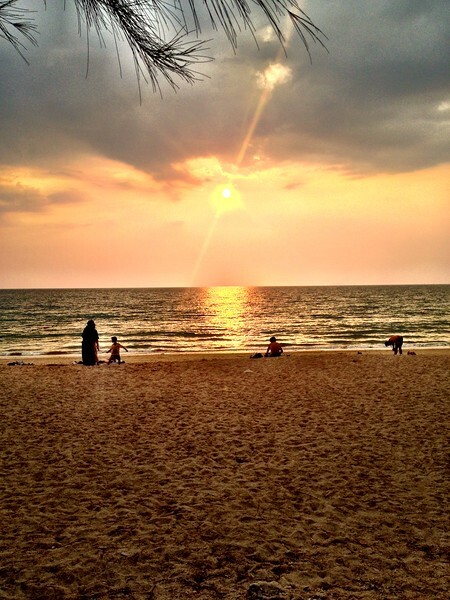 No matter which beach you choose, the sunsets are beautiful on Koh Lanta. Sunset on Pra Ae Beach, Koh Lanta Thailand.